I am so excited! The baby room is coming along. 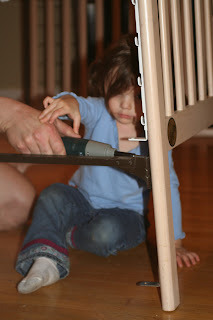 Here is Holland and Jonathan putting together the crib. Holland has been so eager to help set it up and she did a great job. I will post nursery pictures once it is all ready. It is so hard to believe that the next phase in our life is going to include a baby! This pregnancy has been so abnormal! I did have bedrest with Holland too, but it wasn't until the last 5-6 weeks. I absolutely loved being pregnant with her. I loved the maternity clothes, the shopping sprees, the nesting bug, the decorating, the organizing and re-organizing, the showing off of my belly, the energy surge, the setting up of the room, the cravings, and even the emotional roller coaster! I loved it ALL! I am so grateful that I was able to experience all of that once in my life!